LOCATION. LOCATION. LOCATION! Our shop is in the courtyard of an iconic building – The Bluecoat. 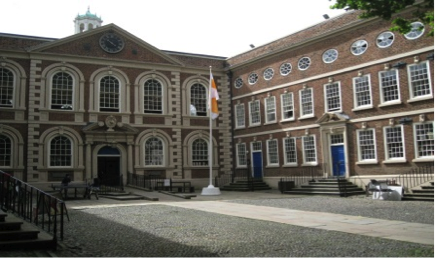 Grade 1 listed and the oldest building in the centre of Liverpool, the Bluecoat was built in 1717 and for the last 100 years has been an active Arts Hub. The Bluecoat is right at the heart of the city, parking nearby and within a quarter mile of both main rail stations. Access is also available on the level through the main reception. Galleries, studios including fine printing, other arts activities and related retail wrap around both the courtyard and the tranquil inner garden. See more on www.thebluecoat.org.uk Please enter our door as seen on the right of the picture above. You will find a selected range of 400 years of publishing in a spacious layout similar to our previous shop in Southport. As always, we are keen to acquire fine books. For our online stock – please use the link above. If you wish, please do contact us directly. We delight in welcoming customers old and new to our shop. We are open TUESDAY to SATURDAY from 10.30am to at least 5pm. Liverpool Echo places us among the 23 places you must visit in Liverpool. We’re in there at No.7.